I visited my sister and brother in law in Cape May, early October and went for a long, peaceful walk on the beach. It was a beautiful sunny day with diamonds shimmering on the ocean. 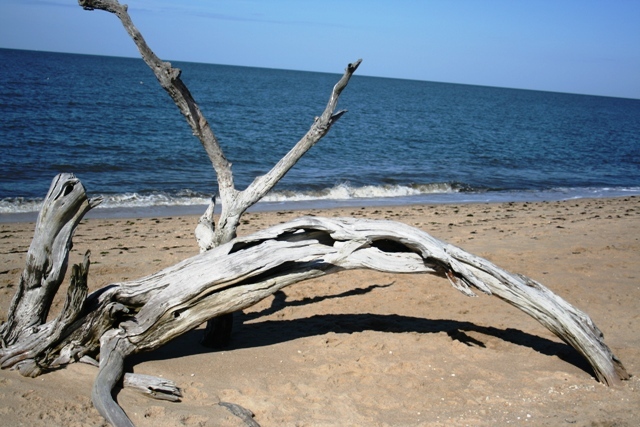 This beach has the most amazing driftwood colored in the silver that comes from many years of saltwater and sand washing over the driftwood. The driftwood appears rough and textured in areas but is satiny soft to the touch. These walks are to reflect on the world around me, to bond more with my sweet sister and to think creatively; three things that are good for the heart and soul. I only wish I had the means to get some of these nature works of art to my studio but I know they are only a two hour drive away. Enjoy all your sunny days! The sun is just starting to come out and I can feel the warmth in the air although it is not quite the same as the sun on a summer day, as it is officially fall. I am recalling a summer that was full of many exciting and memorable days, the most important; my daughter’s wedding. To unwind for a moment during all the frantic last minute preparations I decided to do something for my creative spirit and signed up for a papermaking class taught by a fellow Artist of Yardley member. I arrived at Kathy’s home bright and early on a Sunday morning in August to find a tent and tables set up in the driveway of her home. Kathy, and I worked hand in hand filling the tubs of water with the materials that would eventually result in beautiful handmade paper. But what was more thrilling was then taking this paper that I had just made and adding colors. The bins of color; yellow/sun, blue/sky, green/ocean, papaya/imagination were there to dip your paper and create the most amazing designs on the paper. 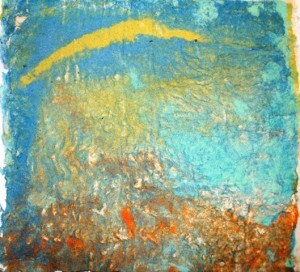 I have some paper that is beautiful enough to frame and I have attached one titled; Sun Over Paradise. If ever you have the opportunity to take a papermaking class, do it, you will love the process and the result. Sunburn Awareness – Could save a life! Most of us plan to check the batteries in our smoke detectors, at this time of year. A smoke alarm is critical for the early detection of fire in your home and could mean the difference between life and death. Fires can occur in a variety of ways and in any room of your home. But no matter where or how, having a smoke alarm is the first key step towards your family’s safety. Another fall check-up is your own personal full body check. We all spent a memorable summer swimming, sailing, surfing, fishing, boating, beachcombing, gardening etc, to be sure you are sun safe schedule your yearly dermatologist appointment for yourself and your family, could save a life! Tell a friend, could save another life! Helpful tip about our bodies; if you have a sore that has not healed within 2 weeks, have your dermatologist check. Our bodies are amazing machines capable of healing quickly. As a designer you learn there are many avenues to take in the design concept. A designer can play it safe or be as creative as their imagination will take them. Fortunately for me I design in fiber and metal so I can really stretch the rules in metal and reign things in while designing in fiber. The more I find myself back in my metal studio the more I want to create more exciting pieces for my sun protection clothing line. My philosphy on sun protection clothing is; if I have to wear this type of clothing I want the clothing to express who I am and this is what I want for my customer. I want my customer to feel comfortable and confident in style and protection in Sun Threadz. 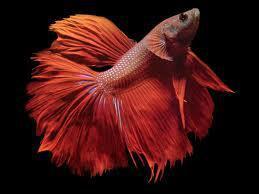 I came across the image I have posted of this beautiful fish and my goal is to design a piece for Sun Threadz that will play on the beauty, color and movement of this beautiful fish. Stay tuned for future updates on this design. My beautiful daughter, Juliet, is getting married in September. 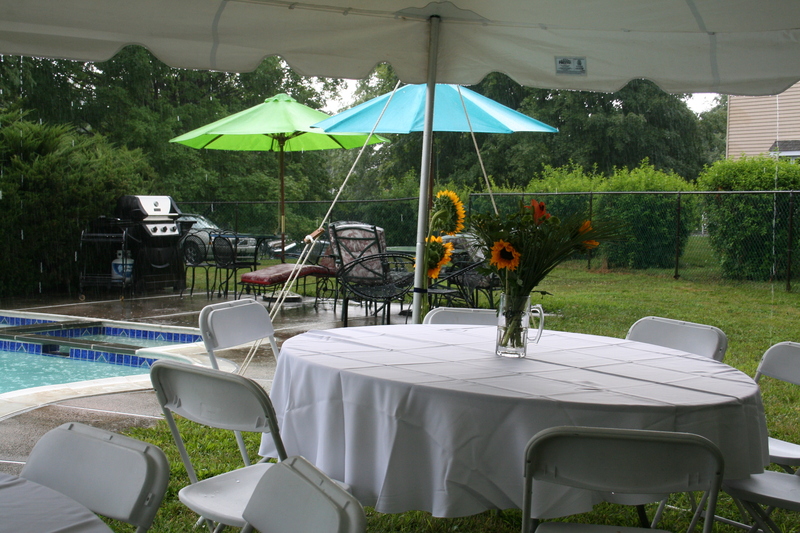 Juliet’s bridal shower was on Saturday July 28th with a beautiful tent poolside with 4′ sunflowers around the tent and the yard and just as the guests were arriving at 1:00pm the skies opened. Well fortunately we had not taken the food outside. There was rolling bands of thunder and as we know if there is thunder there is lightening so we were very cautious about venturing outdoors. The skies appeared to brighten, saw some patches of blue and white puffy clouds and some of the guests decided to go outside and some roamed back and forth. When Juliet finished opening all her beautiful gifts everyone started to eat and since the sun was out many of the guests went outside to eat and then we had another downpour. By this time it was just an added dimension to an otherwise magnificent day! 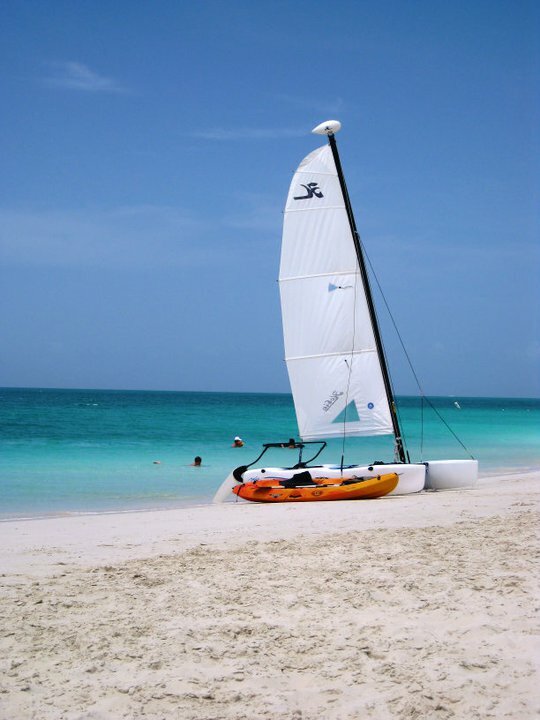 Monday morning after your memorable beach weekend; were you sailing, surfing, sunning or beachcombing? If it were me I would be swimming, sailing, bodysurfing, reading, then some beachcombing, picking up beautiful shells, seaglass and I am always on the lookout for driftwood. I once created a totem pole from driftwood with memories of that summer created by my daughter and all her cousins in Cape May – memories! 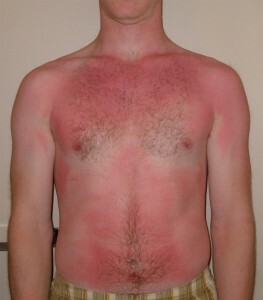 You can still visit Paradise and stay safe in the sun; sunscreen applied generously, hat and sun protection clothing. 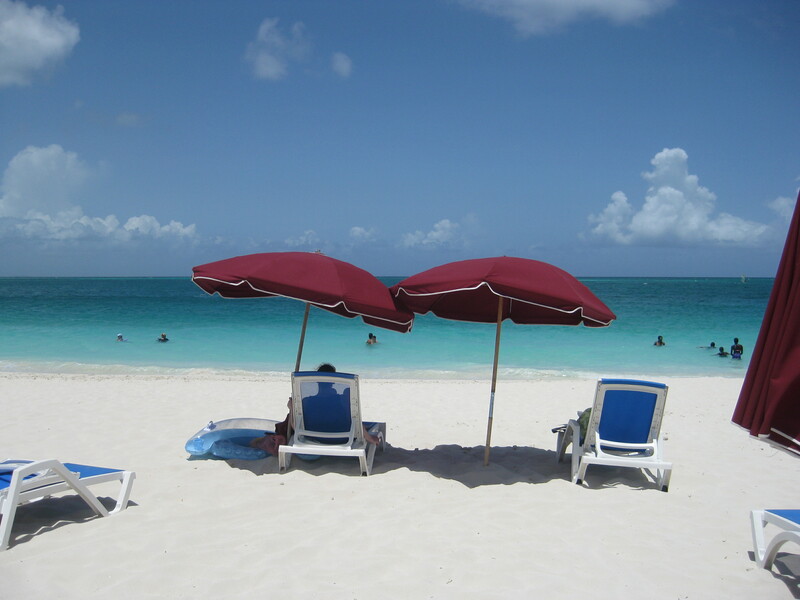 My trip to Turks & Caicos.